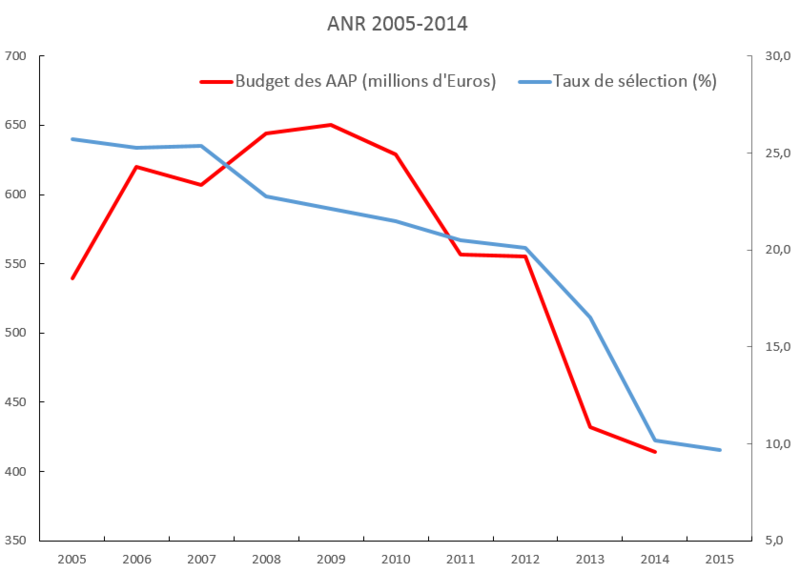 In France, the success rate for national grants has gone below 10% (with the ANR). Not surprisingly since the budget has dropped in recent years. Unfortunately, there is not much else that is available for labs (apart from European grants, which have similar success rate). The situation is also quite difficult in the American's NIH (although not as bad). With success rates so low, many scientists complain about the time wasted on writing grants that eventually seem to be more or less arbitrarily selected. This is not just an expression of the frustration of losers: once again a study comes out showing that peer review of grants is no better than chance, when applied to the top grants. The public should be aware of this: writing a grant application takes a significant amount of time (not mentioning reviewers time), and 90% of this tax-payed timed is completely wasted, in a process that is not better than lottery. Does this really make sense? How have we arrived to such an absurd situation? There are different factors. The first obvious error I see is to fund scientific projects almost entirely based on a competitive grant system. Only the best science should be funded, we hear. Makes sense. Really? Given that both the basic infrastructure (administration, space) and the salary of permanent scientists are paid for anyway, what this advertising slogan means concretely is that only a small proportion of paid scientists will be given the means to work normally. How does that make sense? So the first obvious thing to do is to ensure that there is a baseline that allows labs to work normally (eg pay for conferences, publications, basic equipment). Why would you permanently hire a scientist and then not give her the means to work? Absurd, but that's what the CNRS currently does (main French research organization). INSERM (medical research organization) gives a start-up package to junior scientists; it covers only two years though, but is certainly an improvement. It is only quite recently that there is a competitive grant system in France. Many people didn't (and still don't) like it, partly for the obvious reasons I just discussed. Personally, I don't think it's a bad thing in principle. It has one value, which is to shift the power from lab directors to individual scientists, who can be more independent (that is, if they get a grant). The problem is not so much that it exists, but that it entirely replaces any other means of funding. But a competitive grant system doesn't necessarily need to be based on projects. Great if you have a particular project that requires specific expensive equipment, for example. Or a project that requires simultaneous funding of several partners. But in most cases I know, scientists use the grant system to fund the daily work of their lab, and pitch it into a “project”, sometimes assembling different arbitrary “partners” just because the system requires it. Everyone knows that the best way to get a grant is when you already have the results but have not published them yet (so-called “preliminary results” that grant reviewers like so much). Then you get the grant to fund the “preliminary results” of the next one. It is not always like that; sometimes you really do have a good project idea – although in most cases you will use the budget parly for things that are not in the grant anyway, since it's research, not an engineering project. This happens because the funding system is built this way. Scientists have no choice but be cynical, which also results in a huge waste of resources. For programmatic funding (ie funding political priorities, say research on energy), a project-based grant system might make sense. But for basic research, all we ask the funding system is to fund individual scientists or labs because it is believed that they will do good science. For experienced scientists, the best way to predict whether they will do good science is probably to just look at what they did before. Anyway, that's what grant reviewers partly do when they judge CVs and “preliminary results”, with the added bias of story-telling skills that the project system emphasizes. So, there should be a competitive system that allocates grants based on previous work. This system already exists: it is used for hiring and promotion; it also exists at the level of teams and labs, except it has little impact on budgets. Let us just expand it and combine it with some long-term budget, and a lot of resources will be saved. One possible objection is that it is difficult to estimate budgets if there is no specific project. True, but in reality this is exactly the same problem for project-based grants. Reviewers, who are often international scientists, cannot and do not judge budgets. In practice, the institution generally sets orders of magnitude for budgets, and applicants just ask for the maximum budget (there are of course exceptions). A second objection is that it doesn't work for junior scientists, since they don't have much to show in their CV. I disagree, because they are hired through a highly competitive process, which is not much based on projects but on their achievements. So by design, the junior scientist did go through a highly selective process and should be granted budget. This is just called a start-up package and should be generalized. There is a valid concern, however, which is to compare scientists that are at very different stages in their career. But this doesn't sound like an impossible difficulty; one could use for example a similar system as the ERC (starting/consolidator/advanced). All this being said, I believe there is still a need for project-based grants, but with a smaller perimeter. Projects make sense when they require setting up a collaboration, or buying some specific equipment, or within programmatic constraints. Not so much in general to fund a single team or individual. I would like to make a final suggestion. If the project-based system still has a very low success rate, so low that selection is random, then there is a simple way to increase it and waste less ressource. One suggestion made in the abovementioned paper is to use a lottery. Indeed if the process is no better than chance, we might as well dispense ourselves of the review process and save some time for reviewers. This is an improvement, but it still wastes the time of applicants; I don't think it would be received very well. There is another way that also saves the time of applicants: let them apply only every other year (say, if you are born on an even year then you can apply only on even years). The number of funded grants would stay the same of course, if the budget is the same, but the success rate would automatically increase. Maybe not by a factor of two, but probably not far from it. Note that this is not the same as the individual strategy to decide to apply only every two years; when selection is random, it is in your best interest to apply every year, because each application is independent. There is not even any reason to modify your application between successive years. Whereas if success rate is forcefully increased by blocking part of the applications, the same individual success rate is obtained by applicants with half as many applications. In addition, it makes selection less random. This system is clearly better than lottery since you know in advance that you will be blocked and don't have to write a grant. You can also prepare better for the next round. Ensure a baseline budget for each individual scientist or team, which allows them to work normally (conferences, publication costs, basic equipment). Have a competitive grant system based on past rather than hypothetical future. Have a smaller competitive project-based grant system. Increase success rates of competitive systems (possibly both) above chance level by letting scientists apply only every two years. None of these propositions depends on total budget – which is clearly too low in France, but that's an obvious point.